[12:31:27] <JT-Shop> alex_joni: some users say they don't get the conformation e-mail, I mailed one guy 5 times this morning before he got one... any ideas? [13:04:27] <jepler> that is one possibility. It is obviously some difference between the config file that works and the one that doesn't..
[13:04:56] <jepler> if you can show me a simulator configuration that has the problem I can look into it further. [13:06:08] <jepler> no, because I can't run that configuration. that's whay I said I would need a simulator configuration (one that runs without any attached hardware) in order to investigate the problem. [13:08:44] <jepler> src/emc/usr_intf/axis/extensions/emcmodule.cc function Logger_start gathers the points and function Logger_call draws them. [13:13:49] <jepler> have you set [DISPLAY]GEOMETRY=XY;UV in your inifile? [13:16:25] <jthornton> is there a md5sum download file somewhere? [13:21:59] <jthornton> from the manual "If you downloaded the md5sum as well as the iso, you can ask the md5sum program to do the checking for you. In the same directory: md5sum -c ubuntu-10.04-linuxcnc1-i386.iso.md5"
[14:58:15] <micges> JT-Shop: which live cd? [15:24:14] <skunkworks> he would install the livecd but linux would not get installed. [15:24:39] <skunkworks> JT-Shop: do you have internet access at them machine at the time it gets installed? [15:25:02] <skunkworks> Could ubuntu be doing some sort of update during the install that causes the problem? [15:41:05] <JT-Shop> skunkworks: have you ever seen a md5sum file for download with the livecd? [15:41:16] <skunkworks> Incense and crystals? [15:42:33] <skunkworks> can't you check the cd from the grub menu? [15:53:48] <JT-Shop> skunkworks: unplugging the lan cable and now LinuxCNC is on the menu wtf? [16:07:24] <JT-Shop> <JT-Shop> skunkworks: unplugging the lan cable and now LinuxCNC is on the menu wtf? [16:12:04] <skunkworks> I think if you have a network connection - ubuntu does updates while installing. So - I would guess something that ubuntu is doing is screwing up the install. [16:13:40] <skunkworks> I seem to have to futs with it every time..
[16:15:45] <jepler> what is the statement of this problem? [16:16:07] <JT-Shop> is it still emc2-dev or is it linuxcnc-dev now? [16:16:45] <skunkworks> It seems - If the linuxcnc livecd has access to the internet while installing - for some reason - linuxcnc doesn't get installed correctly. [16:17:03] <jepler> please pastebin /var/log/dpkg.log from an affected install. [16:20:03] <skunkworks> JT-Shop: you said that was the latest livecd (one with 2.5 on it) ? [16:23:13] <skunkworks> is that the only one you tried? [16:24:26] <skunkworks> do you know if they where older versions of the livecd? [16:27:11] <jepler> "pulling a microsoft"
[16:32:23] <jepler> double check that you have the build prerequisites installed. [16:33:00] <joe9> jepler: i have "googled" the error message but nothing is helping. [16:33:15] <joe9> i think there is something more involved than that. [16:33:29] <joe9> i checked the link/thread you posted earlier. [16:33:34] <joe9> but, that was no help either. [16:33:51] <joe9> I do not use debian/ubuntu and I also have all the requisite headers. [16:35:42] <joe9> jepler: that is a good point. let me double check that. [16:41:00] <joe9> jepler: let me check the link posted by you. [16:43:44] <joe9> jepler: thanks a lot. [16:43:48] <joe9> jepler: will try it. [16:47:46] <jepler> JT-Shop: does that mean you failed to reproduce the initial problem (linuxcnc programs missing after install from live cd with network connection) on this dell? [16:50:33] <IchGuckLive> can i make somthing visable out of the emcmodul.cc in the terminal by ? [16:53:16] <jepler> I notice it has -I/usr/include/python2.6 just like when I did the standalone compile..
[16:56:49] <joe9> jepler: thanks for your help. one of my CFLAGS or CXXFLAGS is causing that issue. I will keep you updated with which one in the next few mins. [17:02:26] <IchGuckLive> chep for testing woudt be good to hardcode rz = s->foam_w; TO rz = 1.25; ? [17:04:56] <joe9> jepler: oh, ok. that makes sense. [17:05:30] <joe9> setting the CFLAGS statically works. [17:08:06] <jepler> er, except it is? [17:08:43] <jepler> hopefully now you can get on with your life, anyway..
[17:34:17] <mhaberler> andypugh: were you referring to execute an RTAI task (the _ function in a comp) as a Python callable? [17:34:47] <mhaberler> or some Python code 'on behalf of' (signalled by) an RT task? [17:36:37] <andypugh> No, I was hoping to have userland code in the same file as the realtime code, with access to the same data structures etc. [17:37:11] <mhaberler> so a second comp really, userland, just shared data? [17:42:16] <andypugh> mhaberler: Does it imply that? Can't Python just call the code and wait for a reply? [17:44:24] <andypugh> Do I need to do that? [17:47:33] <andypugh> I was rather hoping that ctypes could do it, but I get "file not found" when I try. Which either means is doesn't work, or that I am doing it wrong. [17:51:35] <skunkworks> JT-Shop: you got it to fail again? [17:52:08] <andypugh> mhaberler: I am trying to eliminate the current super-clunky hal-pin interface for setting sserial device parameters. [17:52:58] <andypugh> I could just clone abotu 50% of hostmot2.c and sserial.c into a userland function, but that sems stupid. [17:54:07] <andypugh> I might as well just start from scratch from PCI register access. [17:54:44] <andypugh> I am not seeing why there is a problem. [17:55:57] <andypugh> Do the HAL realtime files get compiled in a funny way that measn that they don't behave like normal code? [17:59:38] <andypugh> But quite possibly without the realtime threads running. [18:04:42] <andypugh> Hmm, that doesn't sound hopeful. [18:05:26] <micges> andypugh: maybe you could do what you want by exporting file to /dev dir? [18:07:16] <andypugh> I am going to hazard a guess that ioctl is not something that Python wants to do? [18:08:30] <andypugh> I think I have pretty-much lost interest though. [18:13:33] <andypugh> Sorry, that last comment might have sounded ungrateful for the advice. My meaning was that this does not look like being simpler than the existing HAL-pin interface. Quite the reverse, in fact. [18:15:16] <andypugh> How did EMC work before HAL? [18:16:54] <andypugh> Yes, as far as I know. I recall hearing that there was some resistance to the addition of HAL. [18:17:23] <andypugh> It might all have been done by NML messages? [18:19:14] <mhaberler> jepler: I saw you worked on FUSE Python bindings.. was there ever an idea around to export HAL as a FUSE filesystem? [18:35:05] <mhaberler> is there a source package for the 2.6.32-122-rtai kernel? [18:41:55] <joe9> http://codepad.org/p27z8g7l error about make: *** No rule to make target `depends/hal/hal_lib.d', needed by `Makefile'. Stop. [18:42:03] <joe9> anyone noticed this on the latest git repo. [18:45:39] <joe9> alex4nder: any suggestions on how to fix it, please? [18:46:18] <joe9> did that, many times too. [18:47:32] <jepler> "works for me"
[18:48:32] <joe9> jepler: thanks a lot. will do that. [19:07:55] <mozmck> that could be. I may have forgotten about it before I was done with the liveCD as well. [19:10:22] <mozmck> I do know that I removed all other kernels, so it must be pulling one from the internet. [19:10:43] <mozmck> I bet just disconnecting from the internet during install would fix it. [19:23:08] <jepler> if we have a ppa, that's news to me; I don't know what's in it. [19:23:55] <psha> hey, +5 to prophecy! 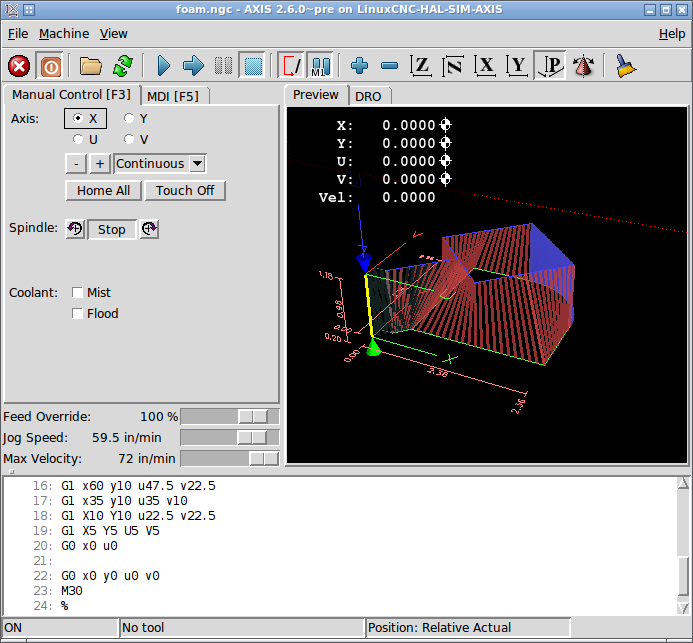 [19:25:30] <skunkworks> JT-Shop: did linuxcnc run? [19:26:11] <skunkworks> I meant when you installed it - disconected from the internet..
[19:35:08] <skunkworks> JT-Shop: 2 things on the dev issue.. was the network actually hooked back up to the computer and where you actually able to surf? [19:43:00] <jepler> are the linuxcnc.org software sources listed in /etc/apt/sources.list or one of the files in /etc/apt/sources.list.d ? [19:48:54] <skunkworks> JT-Shop: if you do this - will it work? [19:49:20] <skunkworks> what version of emc is installed? [19:49:38] <skunkworks> is it an older (2.3) version of the livecd? [19:55:24] <JT-Shop> not part of the git repo? [19:56:24] <jepler> but ... please??? [19:56:39] <skunkworks> so - 2 issues. >2gb with internet access and repositories. [19:56:59] * skunkworks is not sure about the 2gb thing..
[19:57:04] <mozmck> I don't know either... I've been out of the loop for a while. [19:57:57] <skunkworks> JT-Shop: so did you install with less and internet and it worked? [19:59:17] <skunkworks> but then again - I hear voices. [20:03:58] <joe9> I had the rtai_shm as a module in rtai. [20:04:12] <joe9> let me try by compiling it in (not as a module). [20:04:16] <joe9> and see what happens. [20:06:33] <joe9> jepler, these are the .o files in the objects directory. [20:07:02] <joe9> i would expect the linker to be using the shm.o while linking. [20:07:09] <joe9> would you expect the same too. [20:08:05] <jepler> it looks like in the version of rtai we use on ubuntu lucid, the definition of _rt_shm_alloc is as an inline function in include/rtai_shm.h, so there's no need to link a library to provide it. [20:09:01] <joe9> jepler, thanks. will figure it out. [20:15:55] <joe9> jepler, ok, thanks. [20:18:33] <joe9> i think you are correct. the inlining option seems to be the cause. [20:19:27] <joe9> jepler, thanks. I had changed from "Eager Inlining" to "No Inlining"
[20:19:34] <joe9> and that seemed to have caused the issue. [20:19:39] <joe9> very sorry for bothering you. [20:33:09] <joe9> jepler: you genius, it worked like a charm. Thanks again. [20:53:05] <jepler> joe9: I'm glad I was able to get you on track. [22:09:49] <andypugh> jepler: Do you have any opinions on the best way for userspace Python to talk to kernel-space C code? It seems to be more difficult than expected. For some applications HAL pins are a bit clunky. [22:12:27] <andypugh> The specific example I am concerned with is setting parameters on smart-serial Mesa cards. That requires a kernel-space handshaking protocol, but setting addresses and data into hal pins and then toggling read or write bits is a bit painful. Especially as in an ideal world we would be querying the cards for their parameter names and values. [22:14:49] <joe9> WARNING: "__fixunsdfdi" [/home/j/dev/kernel/src/emc2/emc2-dev/src/hostmot2.ko] undefined! -- getting this warning with the latest git repo. [22:55:32] <jepler> that function is used by gcc internally to convert a 'double' to an 'unsigned long long' (for instance, where there is a cast). This function is not normally available in the kernel. The assumption in linuxcnc would be that this is written as an inline instruction sequence, I guess. [23:49:37] <jepler> the only compiler flags I can get to give me a call to __fixunsfdi on x86 are -msoft-float (which is normally specified by kernel's makefiles but is supposed to be unset by linuxcnc's own cflags)..